The protagonist of the fourteenth century star system. The first room is a leap into the unknown. Deep shadows and the darkest of iron used to cover the floors and volumes, according to the project of setting up “in black” by Mario Bellini, welcome visitors into a gloomy forest illuminated by the light of faith. The Madonna of San Giorgio alla Costa and the Badia Polyptych emerge from the shade like apparitions: an epiphany of painting. Giotto di Bondone (1267-1337), known simply as Giotto, was the Dante of Italian art, the father of a modern language, a divine comedy comprised of saints and Madonna’s that widens the heart and mind with its open spaces, living nature, profound humanity. 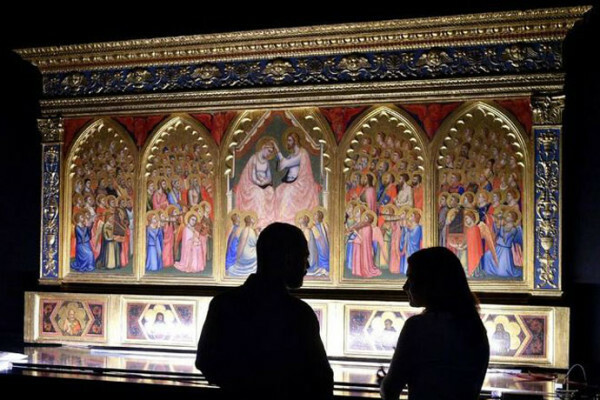 A dolce stil novo (sweet new style) told by the “Giotto, l'Italia” (“Giotto, Italy”) exhibition, open beginning today at the Royal Palace, through 14 major works, masterpieces that have been familiar to us since high school. Curated by Serena Romano and Pietro Petraroia, produced by the city hall and by Electa, with an investment of 1.6 million euro, this exhibition has the great advantage of being monographic, a “one man show” without flaws or replacements, no minor works, uncertain attributions, friends, relatives or future heirs. Just Giotto and a selected group of pieces for a never-before-seen itinerary. The exhibition held at the Uffizi Museum in 1937 gathered eight works. It seemed like a miracle. Today, there are almost twice as many and it is a record. 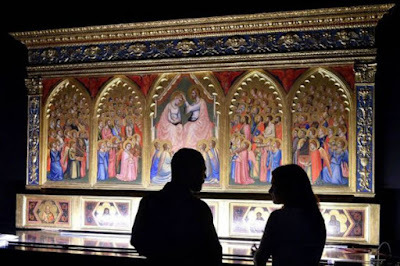 In fact, during his lifetime, in fifty years of work, Giotto signed about twenty individual works, including crosses, altarpieces and polyptychs, beyond the illustrious frescoes spirited throughout Italy. This also explains the national slant of the title: “Giotto, Italy”, in the sense that, at the dawn of the Renaissance, his figure, halfway between craftsman and entrepreneur, courtier and intellectual, became the symbol of an entire country, a testimonial of a shared culture. “The protagonist of the fourteenth century star system,” explains Serena Romano, “Giotto embodies the model of the entrepreneur, of the creative who conceives ideas and entrusts them to others to execute. A forefather of Jeff Koons and all of contemporary art where genius counts and not the execution.” So, it is useless to look for his imprint between the heads of angels that crowd the coronation of the Virgin in the splendid Baroncelli Polyptic of Santa Croce in Florence. Giotto, prince of a medieval factory, invented the revolutionary formula of the continuous narration, a single scene that breaks through the limits of the doors, but who then assigns the task of completing the painting to his staff. From the first room to the last, the invitation is clear: look for signs of a revolution. In God the Father, which came from the Scrovegni Chapel in Padua, the depth of the throne seems to ‘pierce the wall’, as Mario Sironi said, and the foreshortened hand anticipates the famous feet in the foreground of the Dead Christ by Mantegna by nearly two centuries. In the polyptych of Santa Reparata in Florence, the tenderness of baby Jesus and the loving glance of the Saints bring true sentiments on stage. In the Stefaneschi Polyptych, the altarpiece painted for the Basilicata of St. Peter that has never left the Vatican in 700 years of history, there is a chessboard perspective, an altarpiece within an altarpiece, put together like a Russian doll, which deceives the senses. In a journey that crosses Italy and meets with the most illustrious patrons, from the order of the Franciscans to the papacy, from Roberto d’Angiò to the Florentine bankers, we discover the fortune of his talent and the long wave of his fame, which reached Milan and the court of Azzone Visconti, for whom he painted, right in the Royal Palace, a cycle of frescoes now lost. The exhibition ends with a medley of quotes by modern authors bowed to his genius: De Chirico was enchanted by his ‘metaphysical spaces’, and Rothko by his ‘disintegration of unity’, Klein by his ‘entirely blue monochromes’.